Irish Lotto makes use of what is referred to as a matrix of 6/47. This signifies that when you play Lotto, you should choose 6 digits from a 1 to 47 range of digits. If you are able to match each of the 6 digits drawn you become a jackpot winner. In addition, a bonus number is drawn after the 6 key digits; this is in order to establish winners on the prize structure of tiers 2, 3, & 6. Apart from the jackpot itself, 6 other methods exist that enable you to become winner of Irish Lotto. This means thousands of prizes are available to be won two times every week. A facility for ‘Quick Pick’ is present when playing Irish Lottery. This has a lot in common with the option for ‘Lucky Dip’ that is utilized in Europe’s EuroMillions, UK National Lottery and majority of the lottery games in USA. This signifies that you can request the lottery trader or computer to randomly choose each of your Irish Lottery digits on your behalf. The least number of panels or lines that can be in your possession has at all times been 2 lines to each draw in the Irish Lotto and every line costs €1.50. Who is able to play Irish Lotto? Similar to other lotteries in the globe, before, just citizens residing in the state or country where the lottery happened were permitted to play in any lottery games of the specific country. This included Ireland. It was necessary for you to buy your Irish Lottery tickets from a recognized retailer established in Ireland itself. But, today there are recognized firms for lottery ticket sales like Lottosend. You can choose your Irish Lottery digits online and buy your tickets from any place in the globe, where you might be residing. This is wonderful news if you reside outside Republic of Ireland but wish to play Irish Lotto and make sure that you enter in the following draw or simply want to have the ability to manage to purchase lottery tickets online. You should be 18 years old to become fit to buy a ticket or claim a prize for games for Irish National Lottery. Drawing for the Irish Lotto is carried out two times each week by Irish Lottery at 8:00pm GMT on Wednesdays and Saturdays and numerous methods exist for you to examine the Irish Lotto results to check whether you are among the lucky winners. The winning numbers are published in specific newspapers and you are able to watch the draws in real time at about 7.55 GMT on RTE1 TV and they shall be presented on the official website for Irish National Lottery, lottery.ie. If you want to become updated on the latest results for Irish Lotto, you can go to Global Lottery Review. This is displayed shortly following every draw. The winning odds for Irish Lotto are competitive in comparison to a lot of US Lotteries or Euro lottery, particularly when compared to multi-national games like EuroMillions. The prospects of being a jackpot winner for matching each of the 6 key winning digits are 1 in 10,737,573. With these odds, you can become a jackpot winner. For one of the second level prizes, 5 of the key winning digits need to be matched, as well as the Bonus number and the odds are 1 in 1,789,595. In overall, there are 7 varied methods of becoming a Lotto winner and an additional 5 prize levels. 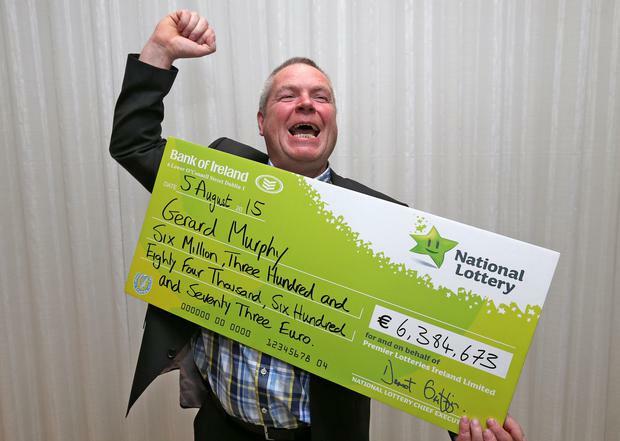 Any prize that you win on Irish National Lotteries shall be paid to you in cash lump sum that is tax-free. 90 days shall be accorded to you from the actual date the lottery draw occurred for claiming your prize. This time frame is vital; an example is the £2,713,334 that remained unclaimed in 2001, on 26th September. This remains the hugest unclaimed Irish Lotto jackpot prize presently and this is not the type of win you should miss out on. It is possible to claim any prize of even €100 from any retail agent of lottery, Irish Lotto HQ or price claim centre agents. You are able to claim prizes starting from the range of €101 – €2,500 from an agent of lottery retail at the Lottery HQ in Ireland. If you purchase lottery tickets online using a reputable sales agent for lottery tickets, however, you should not worry about any of the above as they shall take care of all the details for you when you engage in playing lottery online. It is the responsibility of Ireland Minister of Finance to make a decision on where proceeds should go and the organizations that should benefit. Payment of profits is made to National Lottery Fund. From this account, the profits are distributed to numerous projects throughout the state. Sectors that benefit from good lottery funding sources are welfare, health, sport, recreation, the arts, the Irish language and national heritage. From the time Irish Lotto game was started in 1988, it has presented two awesome games like Lotto 5-4-3-2-1 that was started in 1977 as well as Lotto Plus that began in the year 2000. It started with a 6/36 matrix and six lottery balls are drawn from a machine for lottery that had 36 numbered balls. A long time back, jackpots started at £250,000. Another draw was presented, which occurs on Wednesday evenings increasing the weekly drawings to two times each week.